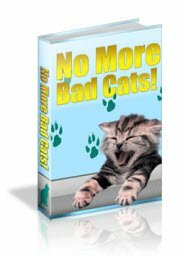 On this cat books page We’ll only recommend cat health and informative cat behavior books that we own. We currently have 2 rescued cats that both had major issues when we first got them as kittens. 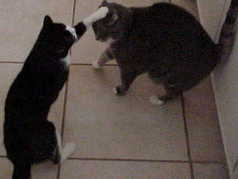 The picture to the right is Thomas throwing a left hook at his sister Riley right before dinner time. You can see the full cat behavior video here. My point is we know about this topic. Hard copy books you can order are available on the next page linked at the bottom. Also below is an update about the feline friendly material you can get for the new amazon kindle reader. First, we’ll talk about cat e-books available for instant download in PDF format. This recommendation comes from my pure enjoyment of the book rather than the author Mary Mathews being a certified veterinarian, which she is not. Mary is a fellow cat lover and author that lives in North Carolina with her husband and 2 cats. 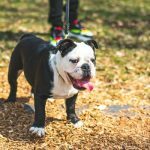 She spends her time teaching others how to train their cats and advising them on cat behavior. 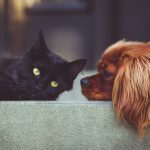 As an author she took the time to research cat psychology and training practices and condensed the best information from dozens of books and eBooks for her own use. She now offers cat owners this quick guide to getting your feline friend back on track. You can train your cat to learn their name, come when called, stop your pet from turning over the water bowl and get them to stop scratching the furniture. In my opinion this is a comprehensive yet easy-to-follow guide that contains a lot of valuable information. Plus the 3 bonuses offered at the time of this writing actually add value to the offer. I really wasn’t expecting to learn much from this E-book, but I actually did. 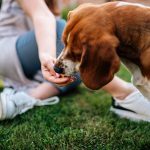 The premise is based on providing a comfortable environment for your cat, reducing stress, and therefore opening your cats mind to behavioral changes. If there is any doubt in your mind that you can read a book about cats and take action with the things you learned, please look at my wife and my son Thomas. 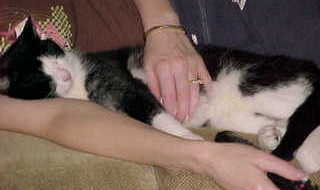 This happy picture of a human mother with her feline son would not be possible without the research provided by the books listed on this page. My top pick in both paper and electronic format for cat owners with problem pets happens to be the first cat e-book that I purchased. 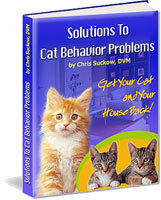 This book is from problem cat behaviors.com and is written by Dr. Chris DVM (Dr. of Veterinary Medicine). This is only one of a few electronic books that I found, written by a veterinarian. 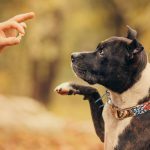 This seems to be important because many of the facts and information that’s provided is from veterinary journals that only a professional DVM would have access to. My favorite section was related to the cats personality, and how this can be changed. My cat Thomas is a testament that a felines general personality can be altered. When we first got him, he had an ear mite problem, and we had to treat him with ear drops twice a day. Our relationship started off with a rocky road and made Thomas withdraw from our contact. We were able to turn this behavior around in about a six-month period. Now Thomas is truly a mama’s boy, as shown by the happy picture with momma (above). I will give credit to Dr. Chris for providing the information and also providing e-mail support that comes with his very complete package. 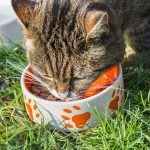 Not only is it well written and helpful material, but must reading so you can understand your cat before you begin training. When I went back to the site to make sure all was well I found the site down for maintenance. I’m not sure on the status going forward. Read cat books with a Kindle wireless reading device! The electronic-paper display that started it all provides a sharp screen that looks and reads like paper. Save trees and your eyes at the same time! There’s no eye strain because it’s not back lit. I think people are going to be very, surprised and delighted with it. A lot easier to read than a lot of paper books are these days. Enjoy your favorite newspaper delivered right to your kindle every morning. Plus all the best sellers on Amazon are available in kindle format for a fraction of the hardcover price. This device pays for itself over time and helps the environment by saving trees and reducing waste. Give this page a bookmark or share with friends interested in cat books.